As the time seems to drag by in the final hours of The Great Kate Wait, here are some facts and figures you didn't know about the future king or queen. 1 – The date in July when the baby's late grandmother, Princess Diana was born in 1961. 2 – Number of years the Duke and Duchess of Cambridge were married before the birth of their baby. Also, 2: Weeks of paternity leave Prince William will receive from his job as a search-and-rescue pilot in the Royal Air Force. 3 – William and Kate’s baby will be born third in line to the throne and the Queen’s third great-grandchild. Three is also the number of possible last names for the baby, if William and Kate decide to choose one: Mountbatten-Windsor, Wales or Cambridge. A last name is not necessary as the baby will be referred to as HRH Prince or Princess. 4 –Prince Harry will now be fourth in line to the throne, thanks to his little niece or nephew. 5 – The royal baby will be the great-great-great-great-great-grandchild (5 greats) of Queen Victoria. 6 – Number of King Georges so far among British monarchs. 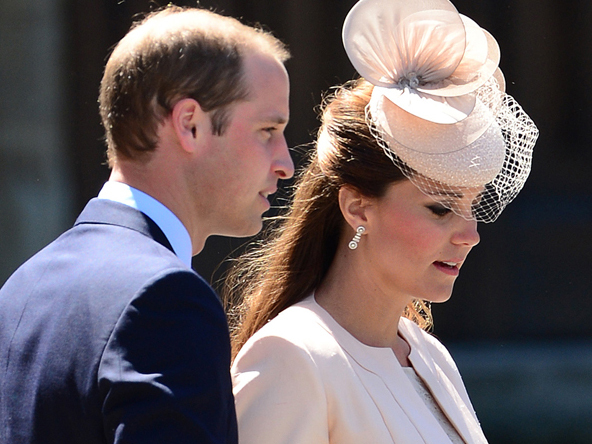 George is thought to be a baby name front-runner if William and Kate welcome a baby boy. 7 – Pounds Prince William weighed when he was born on June 21, 1982 (7 lbs., 1½ oz., to be exact). He was christened on August 4 1982 by the Archbishop of Canterbury in the Music Room at Buckingham Palace. 16 – The baby will one day be head of state of 16 countries. 21 – A common day of the month for royal births: Queen Elizabeth's birthday is April 21 and Prince William's is June 21. 31 – William and Kate will both be 31 when the baby is born. 33 – The temperature in Celsius to which the mercury is expected to rise on 22 July – the UK’s hottest day of the year so far. 43 – If the baby follows the Prince of Wales and William on to the throne, he or she will be the 43rd monarch since William the Conqueror in 1066.